As the global equity selloff enters day two, the Business Spectator is offering an opinion on commodities and recessions similar to mine. The big fall on Europe tells us that monoline insurance is as big, if not bigger, than sub-prime. Worse still, it will eat into the heart of European banks and institutions who were handed huge surplus money piles by the middle eastern countries that did not want to invest is US dollars directly. Accordingly, the European banks invested much of this money in 'AAA' American securities, as determined by the rating agencies, which relied on monoline insurance company guarantees that are now not worth the paper they were written on. In the UK, again encouraged by the big middle eastern deposits, banks and institutions have financed an incredible splurge in office building without tenants locked in. These buildings will cause huge losses, so the banks face a double blow when London Sneezes. So, in summary, a chunk of the oil surpluses have been lost by UK banks, resulting in the fear that the Arabs might take their money back home – which is why UK banks have been hit very hard in the stock market. What the share markets are telling us is that we face the combination of a US recession, and likely a severe European downturn with major capital and bank losses. They are also telling us that the commodity boom is over for a while because these downturns and recessions will hit overall demand. Confidence in the calibre of highly-paid senior executives is starting to erode. How did American bank executives come to plunge so much money into sub-prime loans that customers did not have the slightest chance of paying? Why did London bankers fund office blocks without tenants? How did the ratings agencies give AAA-ratings to insured loans when the insurance companies had given far more high risk guarantees than they could possibly cover? As late as last week in the US, Fitch gave MBIA guarantees a AAA-rating when the largest debt insurance group was in serious trouble. The rating agencies will spend the next decade in court. Suddenly the mineral market looks like it might have peaked for a time. We have a likely recession in the US and serious problems in the UK and Europe. Japan fears a recession and China is slowing down. The US is clearly in recession. The Eurozone and UK are headed there. But sometimes a picture tells a better story. One indicator of slowing business activity I have been tracking is the Baltic Dry Shipping Index. My friend Nick at Sharelynx Gold sent me this chart earlier today. The Baltic Dry Index is an index covering dry bulk shipping rates and managed by the Baltic Exchange in London. 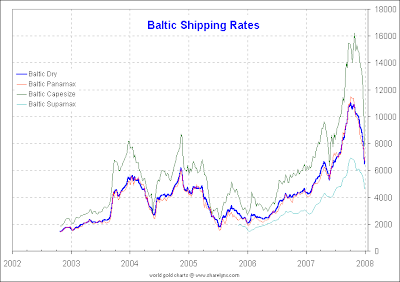 According to Baltic Exchange, the index provides an assessment of the price of moving the major raw materials by sea. Taking in 40 shipping routes measured on a timecharter and voyage basis, the index covers supramax, panamax and capesize dry bulk carriers carrying a range of commodities including coal, iron ore and grain. The index is made up of an average of the Baltic Supramax, Panamax and Capesize indices. These indices are based on professional assessments made by a panel of international shipbroking companies. Since the cost of shipping varies with the amount of cargo that is being shipped (supply and demand), and since dry bulk is usually goods that are precursors to production (like cement, coal, and iron ore), the index is also seen as a good economic indicator of future economic growth and production. Commodity prices are set at the margin and with China slowing, and much of the western world in or headed for recessions commodities have likely peaked or will soon do so. Yes I know all about the China story, but who doesn't? As various carry trades unwind, and leverage is reduced, we may soon find out how much commodity prices constitute real demand vs. speculation. There was no fundamental reason for the sharp commodities rally in 2007, especially the rally from September through December. That last blowoff seems based on misguided fears of inflation as well as speculation by hedge funds more than anything else. The PPI and CPI have probably peaked as well. Perhaps decidedly so. This view is sure to have people asking me about gold and deflation once again, so here is my opinion: Gold is money and thus gold should do well in deflation. However, there are 10,000 hedge funds out there leveraged Lord only knows how much in gold, commodities, equities, and everything else, so sharp pullback should be expected as that leverage is unwound. 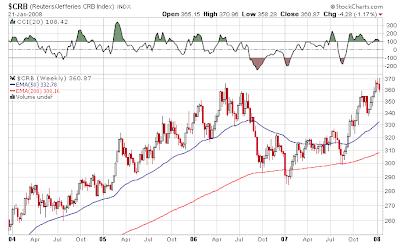 Gold will likely recover from this pullback as will oil. The latter because of peak oil. For now, global recessions trump peak oil, an unwind of leverage is likely to trump gold, and recessions will easily trump commodities, especially base metals. All bets are off if Bush attacks Iran.